ooo I love Lindsay - you did an amazing job. Love the mirrored buffet, love love love the wallpaper. And sign me up for one of those chandliers. She is going to love it! You rocked this out of the park Lindsay! Navy and pink is one of my favorite combos. You had me at preppy and glam....ha! love it! So fun, love the mix of pieces, especially the art (wallpaper I mean) and the rug. I think you nailed the preppy glam! I love these boards Lindsay. it is so fun to put a clients dreams to life! these are lovely selections! That wallpaper feature is FANTASTIC. That's the perfect way to describe my interior style to. Preppy,fresh and clean- love your work girl! I love the pink and navy together...and the wallpaper art is great! Enjoy your day!! I love the fabric for the chairs - whose is it? Gorgeous. 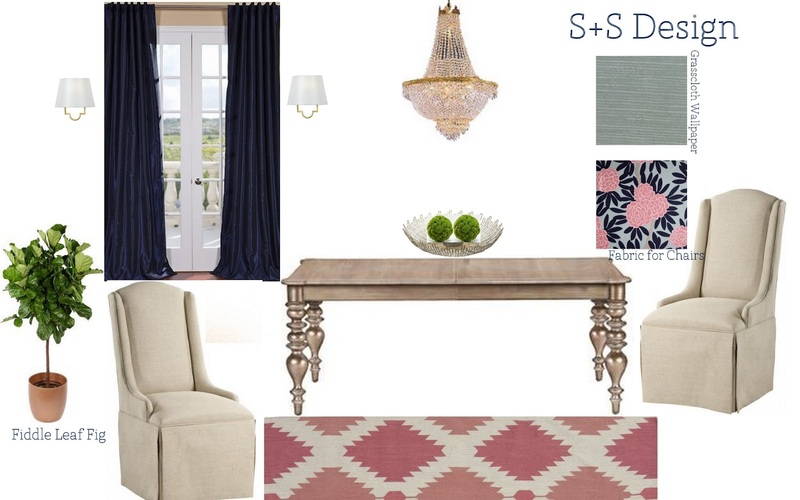 Especially that dreamy rug! Love it. Where can you find a table like that? This is definitely the perfect mix of preppy and glam! I have those lamps! They're perfection. Your client will love 'em! LOVE that rug! Absolutely amazing! What a great dining room this will be!! Love everything about it! 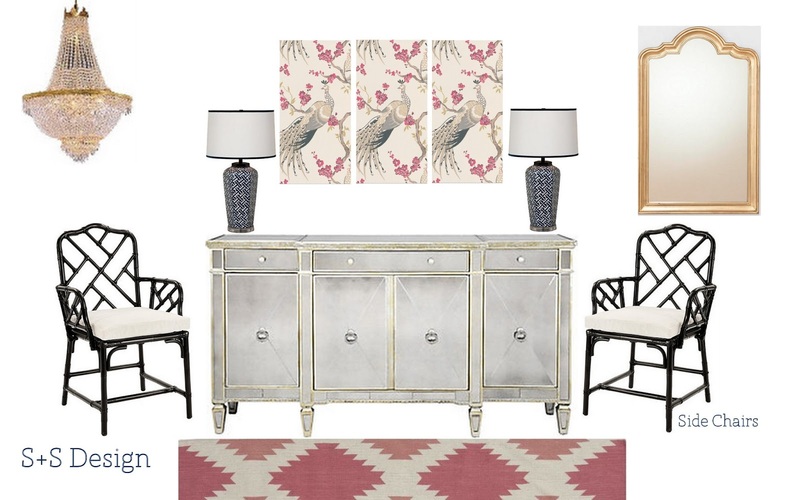 love this preppy glam room- I hope you share pics of it when its completed! LOVE what you came up with here! those wallpaper panels are too pretty! Can't wait to see it all wrapped up. Beautiful job. That wallpaper panel/artwork is amazing! This looks fabulous, Lindsay! I would eat every meal in that room. Love the grasscloth wallpaper + the wallpaper art. This is why you are a design genius... I would not know where to start to balance a ink room but the navy is a perfect match! Lindsay, you rule. Your clients are all very lucky to have you backing them! Wowowow I love this so much! The patterns and furniture picks are perfect. Great job!